Only seeing is believing when it comes to Russia’s ambitious 2050 shipbuilding program. The work on the fifth generation of submarines is already underway. The project will be implemented after the Yasen nuclear submarine construction project is completed. Periodic announcements by Russia’s shipbuilding industry that it is working on a next-generation submarine have been made repeatedly over the past couple of years. In any case, waiting for the completion of the Yasen project could take a while. The 13,800-ton, 390-foot long and highly automated Yasen-class of Russian attack submarines was supposed to replace older Soviet-era multi-purpose nuclear submarine models by 2020. Yet, the exorbitant costs of the submarines — estimated to be twice as much as the new Borei-class SSBNs – has so far led only to the commissioning of one out of eight SSGNs, with a further three to four vessels likely to be completed by 2020. The first of six Yasen-class multi-purpose attack nuclear submarines (SSGN) projected to enter service in the Far East over the next ten years will join the Pacific Fleet in 2017 at the earliest. Russia’s Northern Fleet currently operates one Yasen-class SSGN, the K-329 Severodvinsk, but was projected to receive six SSGNs of this class by 2020, which, given the current status of the Yasen-class program seems highly unlikely. Due to these delays, the Russian Navy decided that it will upgrade ten project 971 SSN Akula-class and project 949A SSGN Oscar-class II nuclear-powered submarines by 2020 (see: “Russia to Upgrade 10 Nuclear Submarines by 2020”). Very little information is available about the likely features of Russia’s fifth-generation sub. Back in 2013, the Malakhit Design bureau announced that it will be equipped with new stealth features, new noise reduction technology, automated control systems, reactor safety, and long-range weapons. Given the current financial constraints of the Russian armament industry and the general dissatisfaction with the Yasen-class, the new fifth-generation sub will in all likelihood be smaller, and carry fewer missiles, in comparison to the Yasen-class SSGNs. As I have written before, Admiral Vladimir Chirkov, the Russian Navy’s commander-in-chief, said in March of this year that there will be no pause in the design and construction of Russia’s next generation underwater strike force. “We have formulated the task for the defense and industrial sector to develop fifth-generation submarines. This work is ongoing. 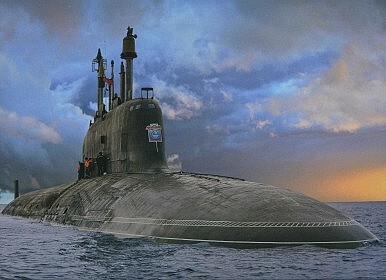 There will be no pauses in the development and designing of new submarines,” he noted. What do we know about Moscow's ambitious plan to build a new class of fifth generation subs?